Hi, Tom, I’m a big fan. Absolutely first I have to say I was a big fan of Ed and my Twitter followers and I wanted to tell you we haven’t given up on getting the series on DVD. Cavanagh: Listen you shouldn’t give up because if you give up it’s all over. It’s all over. There’s going to be no momentum and no impetus for them to get that going. Listen here’s what my understanding is, it’s a really weird thing because apparently is supposed to be about Royal Pains but the Ed DVD and the music right thing because the Letterman Company used so many great, so much great music that the stars were basically just giving to them because they’re Letterman but music rights and perpetuity are a little more complicated than that. But apparently this thing is moving along and so we’re all hopeful that one day Ed will be on DVD. Cavanagh: There you go. You’re getting a long exhale from the Royal Pains executives right now. Okay good. You’re probably right. I don’t want to spoil for anyone that hasn’t seen this week’s ep so I’ll try and phrase my question this way: going into the start of the role did producers already know the entire storyline for Jack and did they tell you at the beginning what to expect or were you surprised? Cavanagh: At the very beginning I was filming a movie in Vancouver, Michael Rauch who’s an EP, an executive producer on the show, the show runner and I, we go way back, we’re old friends, and we had a great time. It was Michael Rauch’s directorial debut, a season prior and he wrote the part of Jack O’Malley, the roguish, swashbuckling, semi-good looking golfer with me in mind. And we had such a good time we thought well, you know, it would be great if we could have a worthy storyline. So when he called me we both knew the arc that the storyline would take, a harrowing but fun arc, and we were both on board with the arc from the very beginning. In other words what I could have just said, I could have just said yes. Cavanagh: Actors like to talk. Actors like to talk. If you just said yes, there’d be no conference. Cavanagh: Exactly right. You’re exactly right. I should have asked her how many Twitter followers she had. You know, if her Twitter followers are all up in arms about that and if she would have said two, that would have been an awesome answer. All right. Well do you find like during this part of the role I guess, do you find that more challenging playing being sick and kind of how do you prepare for that? Cavanagh: That’s a great question. First off, on a larger scale Royal Pains obviously deals with that every week in one fashion or another and so there’s a pathway and a protocol set up for how Royal Pains does it. So for the actor it’s that much easier because they’re used to the subject matter, obviously not the specifics of for example with the lupus, but they have pathways and protocols set up. They have an on-set doctor, they have the answers all rready for you; they’re already prepared. And I had a number of questions about it. You know, there’s an on-set medic standing by. Brad would have a better set description but essentially we got a doctor, an in-house doctor. And I could ask him anything about symptoms, about how I would be reacting because, you know, you do want to get it right, you know, you always hear that about researching a role and it’s a small part on a very successful show but even so you still want to get it right. And so, you know, I had many questions, I did a lot of looking up the subject to make sure that we get it exactly right. And then the challenge is to try and if you know what it’s supposed to be, I’m supposed to feel like and all that, the biggest challenge for this specific character, Jack O’Malley who’s a bit of a – he’s in denial, he’s a things are fine kind of guy and I’m kind of that way as well. And so the idea, what I thought was the biggest challenge was to play him not showing his sickness while being sick. You know? And I don’t know that I got it right all the time but that was sort of what I was trying to convey. You did well. What’s just been your favorite moment in general working on the show? Cavanagh: Any answer to that would sound extremely like a cliché I have to say. But the truth is this about Royal Pains — this is a flashpoint, rare divulgence about Royal Pains — these guys are great. By the way, these guys are great is terrible copy for you but it’s actually true. You know, Michael Rauch, the guy that runs the show, Andrew who also runs the show, these guys are phenomenal human beings, not phenomenal human beings as it applies to the entertainment industry but phenomenal human beings. If any of you who are listening to this have interviewed Mark Feurestein, and I believe many of you have, you know what kind of guy Mark Feurestein is. He’s jet-engine enthusiastic, he’s a wonderful human being, he’s a great father, a great family man, he’s extremely talented and he’s a phenomenal leader for the show. The rest of the cast and the crew are again many people that I’ve worked with over the years, they’re also phenomenal. So going to do Royal Pains and this is actually one of the barometers, if you talk to a crew member around New York City, many of them are trying to get on the show because they know the vibe that the show has. Many times crew members don’t really care that much about the subject matter of a show, but they do care about what the workplace is like and the workplace at Royal Pains is phenomenal. And I think sometimes, not always but sometimes there’s a bit of a (unintelligible) translation to what happens onscreen and I think in the case of Royal Pains that might be true. Can you talk about how Jack’s condition impacts the love triangle with Jill, Jack and Hank as his condition changes? Cavanagh: I can. Well it’s interesting because I think all three of those people have on one side of the ledger things they would like to have happen and on the other side of the ledger, things that are actually happening that impede what they’d like happen. You know, in the case of Jill she’s talking about getting off the, you know, moving up to Uruguay. Jack’s side of the ledger is a little less complicated. I think there’s some moral goodness to Jack but I think he’d be quite happy to just seduce Jill and have things go that way. I don’t think for Jack him having a little bit of lupus is an impediment to him, to his romantic endeavors is the most PG way I can put it. As for Hank, you know, Hank is a good man in capital letters, you know, and so if the moment doesn’t feel right for Jill then I think the moment isn’t right for Hank. I think as far as Jack and Hank are concerned, I think Jack has kind of been a little bit up front about it. He’s like, ‘Look am I cutting your grass?’ He’s like, ‘No you’re not cutting my grass.’ He’s like, ‘Good, I’m not cutting your grass.’ Put that in print. How do you think the presence of Jack raises the stakes for the show as whole now that it’s into its third season? Cavanagh: I think any time you have a character that you’ve been allowed to get to know a little bit, they’ve had Jack on for a few episodes now and so it’s not just a simple guest appearance where somebody gets a hacking cough and then we have to figure out what’s wrong him. I think the writers and the show runners have taken time to invest something of Jack’s personality into the story and as such I think that is the main thing that raises the stake for what eventually happens to Jack. From my own personal philosophy in terms of playing a character I’ve always felt the more a character makes you laugh the more you’re going to care about him. And I think they’ve at least tried to make Jack appealing in some ways and that’s a dangerous line I’m treading here because it sounds, you know, self-complimentary and that’s not what I mean to be. I mean I just think the writing is such that Jack’s a bit of, you know, a bit of rogue and he’s written as likeable and so you don’t want likeable people to have bad things happen to them, at least I don’t. So I’ve got to say I really enjoyed your chemistry with Mark and with Jill, I think it’s really been spot on. And I know that’s probably not the easiest thing in the word when you come in as a guest star so what’s sort of the key to than onscreen successful chemistry for you? Cavanagh: Well that’s a great question. I’m trying to get the right answer. Part of it is, you know, I know Feurestein through osmosis, through shows we both did at NBC and mutual friends so I know he’s a good guy so that actually makes it easy when you know the guy and you like the guy and you get to act with the guy. I didn’t know Jill but she’s a wonderful person and that helps. And I think largely the biggest part of the question, something like that is when you guest star on a show, the show is either welcoming or they are not and when it is unwelcoming you’re just doing your job, you’re a gun for hire, and when it’s welcoming it makes it that much more fun. It doesn’t mean you’re necessarily going to have a better performance but you’re going to enjoy yourself that much more. And rare is the set that’s more welcoming than the Royal Pains set. And that’s not for me because I know people, that’s for if you were to make this call any number of people who have guest acted on the show, I bet they would tell you the exact same thing. And the episode that we’re all going to gladly preview this week, what can you tell us about it, what sort of are you most proud about this particular episode? Cavanagh: One of the most fun things about this episode for me and also I do a small bit of directing here, and there was while we were out on the boat, you know, there’s an adage to directing and one of the adages is never shoot on boat, never shoot boat scenes, never shoot children, never shoot animals. When I say shoot I mean with a camera. I was really interested, we spent basically – most of the episode takes place on a boat, not most of the episode; most of Jack and Jill’s storyline — that’s right I said Jack and Jill — takes place on a boat and it was just massively directed. We had two boats out there, one of them it actually belonged to a crew member. And filmmaking sometimes gets a little bit easier when you take away some of the elements that are otherwise deemed necessary. In this case we had a very small crew, a splinter crew, we couldn’t run around and set up lights because we were out on a boat and it was amazing how quickly we filmed and how much fun it was. We were out off of Montauk Point out in Long Island and it was all the things it was supposed to be in terms of — and negative things — it was not, it was truly fun to shoot. And also it contributed I think a little bit to in Jack’s storyline he’s getting more and more isolated because of the sickness and of course they’re out on a boat, you know, the clock’s ticking, all those kinds of metaphors work for the storyline. And it was really and enjoyable shoot. My question is what do you think it is about Royal Pains that captivates so many viewers? Cavanagh: Wow that is a great question. You know, I can try and come up with an answer and it would just be that. It would be conjecture on my part. I honestly don’t know. I don’t know that I’m the guy to ask about why a show is popular and why it isn’t. You know, my friend Julie Bowen who was on Ed was talking about saddling up to start this show Modern Family and she was hoping it would stick. You know, we were having discussions about it and never in our discussions ever was there an inkling that it would become the biggest show on the planet, you know, the biggest comedy on the planet, they would just be dominating award shows year after year, that within a number of episodes she’d be nominated for an Emmy. All these kinds of things I just don’t know. You know, Michael Rauch was actually, we were both working out in L.A. and we were sharing a house. Michael Rauch runs the Royal Pains show and we were sharing a house, I was working on Trust Me, he was writing for Royal Pains, it hadn’t aired yet and we would be discussing the prospects for the show. And I don’t think we ever looked at each other and went, ‘Well this will be the number one show on cable, hands down.’ I don’t think you ever really know. Or at least I should say I don’t really know. I don’t know what the public is going to respond to. I know why I like Royal Pains. I know that but I don’t know why that makes it the most popular show. I think a lot of times a show runs into its time, you know, and when that happens there’s a lovely confluence of a number of factors coming together and becomes a successful show. I will say this, you know, one thing about that is that the idea that a cable network will stay with a show I think has a lot to do with it. You know, I think in past years shows that would have smaller ratings on a major network might have been treated the way occasionally a cable show would treat a show and allow it time to grow, you know, your Seinfelds, your Cheers, your Friends and then it becomes a popular show. And that’s not the same landscape nowadays but I will say that I’m happy for Royal Pains and I hope they have like years and years of success. And what has been some of your favorite things to shoot on Royal Pains? Cavanagh: Well I mentioned the boat. The boat stuff was great. I have a great time any time I shoot a scene with Mark because there’s a lot, you know, there’s a lot joking around, there’s a lot of tomfoolery, no pun intended, no hanky panky, no pun intended. There’s no hanky panky, that was pun intended. And we just have a lot of fun, you know? I think both of us when it come acting work proceed from gratitude and so it’s nice to find a guy who kind of thinks of it the same way I do and we really enjoy our scenes. Hi. I was Mark hearing one thing that you’re quite a practical joker. So did you get him with anything and if so, what? Cavanagh: Oh man, when haven’t I got him? If you watch closely in last week’s episode there’s a scene where, hell I don’t know it…yes might as well, it’s fine because it’s already aired, but there’s a scene where Reshma who plays Divya has taken Jack’s, the character I play, urine sample and so we did rehearsal after rehearsal where I hand her the cup, the cup is completely room temperature, everything is fine and then we shot the thing, I filled it up with steaming hot apple juice like fresh out of the body. And as they shot the scene I walked up and we always did in rehearsal, I handed it to her and if you watch the scene carefully we have to keep cutting away from Reshma because all she’s doing it trying not to laugh. So that was one. Anyway so those are a couple of the ones that I can probably mention on the conference call and there’s plenty others but we’ll have to wait until we talk one-one one about it. Okay. And also Mark directed an episode I believe. What was he like to work with as a director? Cavanagh: Oh what a taskmaster, I couldn’t stand him. He’s great, he’s great. I think it was his first, if I’m not mistaken, his first time directing and it was nice for both of us because I’d been there and could offer some stuff and he was great. He always wanted to – Mark is a very – Mark is not impeded by pride and hubris, he’s a very humble man, you know, and so I think he did – the episode I believe was last week, it might have been the week before, I think it was the week before, but I thought he did a remarkably assured and competent job. People really liked with him and working for him and my belief is that he’ll be, based on what he ended up putting on screen, he’ll be asked to do the same job many more times. Great. And while you were in the Hamptons did you find any new foods for Mike and Tom Eat Snacks? Cavanagh: Mike and Tom Eat Snacks. There’s a couple of oyster things in there I think. Yes, you know, there’s always snacks, there’s always snacks. It’s a big wide world of snacks out there. You talked a little bit, well a lot, about how much you loved working with cast so if the — now I haven’t seen the episode — but if the opportunity came up would you come back to work with them again? Cavanagh: Oh absolutely yes, absolutely. All right. And then can you share just a little bit about how your experience here on Royal Pains has compared with some of the other guest star roles, where would you rank it in that? Cavanagh: Well I wouldn’t rank it. I think that’s a very dangerous path to go on, to go down. But it’s been like I say, not to beat a dead horse, it’s just been wonderful, you know, I hope to do more of it. I really enjoy the people. Again it all comes down to a lot of the times how the show is run and what the sets are like. I remember I did a number of episodes of Scrubs. It was a very similar experience. You know, the person who runs the show Scrubs, Bill Lawrence, just takes care of his people and just provides an incredible atmosphere on the set. And they’re like Royal Pains always extremely welcoming to people coming and guesting on the show. Those sets when you get on them are, they’re just a boon, you just feel so grateful, so lucky to be able to as a guest, as a hired gun to be in there like that, that is supporting and welcoming. Did you enjoy the opportunity to get, you know, to shoot on a show where there’s a lot of location shooting? Cavanagh: Yes this show is a great show for me. I live in New York and it’s on a New York City doorstep basically because of the shooting in the Hamptons. It shoots on stages that I’m quite familiar with when it shoots its interiors. And its locations are as you can tell from the show certainly glamorous. Not all shows are shot on a beach or in a beach town so it’s not a bad way to go at all. You can’t beat a free guest role at the Hamptons right? I’m just wondering since you’re a guest star on the show, did you come across any challenges establishing your character that you don’t normally experience like when you’re working on longer term projects? Cavanagh: Yes great question. I mean, when you’re a regular on a show, you know, like with Royal Pains for example, a perfect example would be Mark and Paulo and, you know, Jill and Reshma, they don’t really have to – I don’t even have to worry too much about what the character is, you know. They know who they are. It’s like putting on a suit, an old suit, a familiar suit, whatever you want to call it. And with a guest star it’s new and not only is it new you also have to understand its place I think in the show. I don’t think that those four really worry about their place in the show. They sort of know what the goal is and how the show airs and all that kind of stuff. A guest character knows a lot less, you know, and so you have to pay attention and you have to listen to how things are done and what the ideas are behind and the themes that you’re trying to serve and all that kind of stuff. And then you have to go out there and do as good a job as you can. It is different but it’s a challenge in a different way. But I think for every actor once they call action, you have to do as well as you can to serve the character and so the job is different but the same. Okay. And so bromances have become like pretty popular in TV and movies lately and your character and Hank have some pretty good chemistry on the show. So what do you think the appeal of a bromance is? Cavanagh: Well I don’t know that there’s any appeal to a bromance to be honest with you just because that’s one of the words that are we a better society for having invented it is how I feel about that. But I will say this, you know, when two guys – I look at for example something like Swingers for example, when two guys get along as guys do, when the banter and the repartee is witty and flows quickly and feels real, that I think adds some nice flair, a nice touch to the screen. I’ve been fortunate to have a couple of instances onscreen in TV shows where I’ve been able to work with actors where the goal of the writers is to try and create that. And I think they’ve written stuff like that. For example Jack Bernstein, Constance’s episode, these guys have written this kind of stuff and it’s really, really fun to play. One of the – I think there was a tiny little runner in the last episode where we were trying to figure out whether the nephrologist was a child TV star. That thing that just probably women find so incredibly annoying, two grown males going back and forth and bickering over a point going, ‘That’s not her,’ ‘That’s her,’ ‘That’s not her,’ ‘That’s definitely her,’ ‘That’s not her.’ You know? And yet for us I could have done that, annoyingly so, I could have done that scene for like 20 minutes. ‘It’s her,’ ‘It’s not her,’ ‘It’s her,’ ‘It is her.’ And I think we actually did a couple of times but Mark did the directing and had to be the responsible director and cut all our shameless stuff out. But shameless though it might be it’s fun to do. Well, let’s see, Jack is really such a great likeable character. He’s sweet, funny, adorable and just genuinely a nice guy. That’s not really a new type of character for you Ed. Have you ever wanted to play the complete opposite, a darker role, a bad guy or whatever? Cavanagh: Oh yes. No I’ve definitely done that. Just I don’t think I’ve done it on such a – for awhile. For years there I was nothing but the bad character, I had long hair and I played like serial killers and escaped convicts. And what was one movie, something called Heart of the Storm where I would – yes I mean, not to list credits but I’ve done plenty of that. I loved doing it. I did a play here in New York recently where that was the character was just morally reprehensible and I think every actor will tell you as I am telling you that it can really be fun to play the villain. So I’ve enjoyed it when I get to play the villain but I also enjoy it when something is well written like I feel like the character on Royal Pains is well written. I felt the character on Ed was well written. And so be it nice guys or bad guys, largely if they’re well-written guys they’re going to be fun to play. Well just one more quick question. What’s coming up next for you? By any chance are you looking around for a pilot for next season? Oh neat. Well I’ll keep my fingers crossed because I think everybody misses seeing you regularly week after week for more than just a few weeks at a time. Cavanagh: Well that’s very generous of you, I appreciate that. And hopefully yes, hopefully your lips, ears, that will all happen. So talking about directing and all that, would you ever be interested in directing or writing for Royal Pains? Cavanagh: Yes. Look another one-word answer. All right well that’s okay. What have you learned about yourself from working on Royal Pains? Cavanagh: That I am not as good a golfer as I thought I was. Cavanagh: I’m capable of being long winded as you can tell but sometimes in the interest of comedy it’s best to go short. That’s okay. You told us kind of some of the pranks you played on Mark, is there anything he’s ever gotten you with or anything you can talk about? Cavanagh: Has Mark gotten me? Yes or has he tried to and maybe failed miserably. Cavanagh: Well there was the time he took off his shirt while we were walking a down a Brooklyn sidewalk because Mark does an incredible, ‘How you doing’ kind of tough guy, New York-ease accent and he might seem like the kindest, greatest guy but he can also play the New York tough guy. But has he ever really come in prank wise and returned the favor? No because he’s got to up his game a little bit. Hey Tom just a quick follow up again. I was going to ask you about the golf. You mentioned it didn’t quite go as well as you’d hoped. But what was it like trying to come off as professional? Was there a lot of extra work that you put in or how was that experience like for you? Cavanagh: Well it’s, you know, I play a number of sports and you always – I hate it when I watch something of a sport that I play and the guy is supposed to be good or the girl is supposed to be good and then the camera outs them as being terrible. I just hate that because it takes me right out of the story. And so in this instance I didn’t want to be that guy. And so I took a lot of lessons, you know, I took a lot of coaching but it’s interesting the very first time I golfed I really did knock one straight and true and it was on take one with all the crew watching and all that kind of stuff. But Michael Rauch who’s a very good friend of mine and who was directing the episode he knew that in the session prior when we were setting up the camera I was on the driving range for about 40 minutes and I didn’t hit one like that. I shanked everything, you know, I left it short, I hooked it, just like are diving for their lives and then we had four cameras running and I thought, ‘Oh this is going to be really bad’ and then I just nailed it, straight and true right over the camera and 100 plus. And Rauch is like, Rauch from behind the camera goes, ‘I don’t think we need another.’ And the camera operators are like, ‘Don’t you usually take two?’ He’s like, ‘No, we’re good.’ And bless his heart for that moment because I wasn’t going to improve on that. So what always matters is what you have on film, you know, and so as long as they don’t show all the stuff that I’m duffing off camera then I’ll be happy with the performance. Was it a pleasant experience, I mean, do you think you’ll go out and hit the links again or is it just what we saw for the show? Cavanagh: No, no, no absolutely. 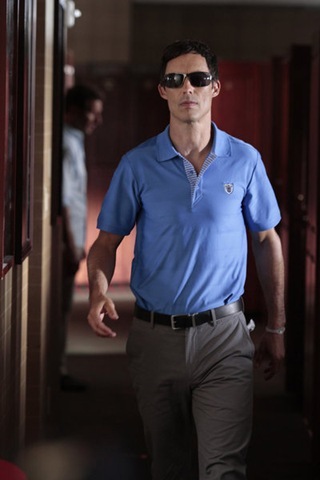 I mean, one of the great things with him being that character is we’re shooting on a great rolling green golf course, you know, sun and blue sky, I mean, it’s like I say Royal Pains they do it right and getting to play that kind of guy it’s fantastic. Previous PostQueen: Days Of Our Lives is Perfect for ANY Queen fanNext PostLouis CK Returns To Parks and Recreation!